The innovation behind Gorilla Baby is right from The Grommet’s backyard. Steve Listwon lives next door to our office, and he’s the Co-Founder of Jaywalk Studio, a design and fabrication shop around Boston. He and his partner, Haik Tokatlyan, heard about us and were inspired to make the first Gorilla Baby prototype from the remnants of their other design projects. Gorilla Baby looks like a minimal, natural piece of home décor, but it is actually a small—and stealth—cord organizer. Not many cord management solutions have a natural, artisan appeal. But this one is designed to organize and be beautiful at the same time. 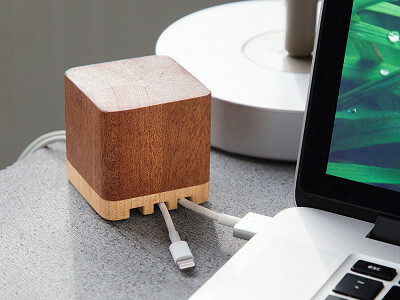 Handcrafted sapele and maple wood encase a steel core, which helps anchor the small cube to surfaces. Three low-profile grooves keep thin wires—like USB cables and phone chargers—straight, while silicone feet add traction. The natural wood grain and rounded corners look elegant and modern. 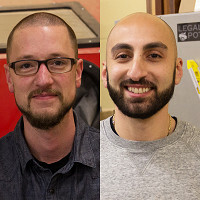 Gorilla Baby—and Steve and Haik—remind us that we’re honored to have a place in the Maker Movement as well as the respect of our local community. Gorilla baby is here! We are proud to unveil our first product on The Grommet. Gorilla baby is the best way to control your cables on any horizontal surface. We are always available to field any questions you may have, and we thank you for taking the time to check out the latest work from Jaywalk Studio. I have a Baby Gorilla that is currently being used on a window sill to hold iphone/ipod cords, it looks great next to all of my plants; beautiful made product - 10x better than the cheapo plastic variants offered. @JASIO, Thanks for the note, Gb is very much at home around plants. @Steve & Haik How long is the cord leading to the electrical outlet? @Ron, The Gb doesn't have a cord of its own, It is used to organize cords you are already using. @Steve Thank Steve, much appreciated! from the video, it looks like you can only handle 3 cords. I have 14 devices I charge with 14 different cables. Do you have a product that will handle 14 cables? @Shelley Hi Shelley, you are correct an individual Gorilla Baby handles 3 cords. We currently don't offer a solution for more cords but we will consider this as a future project. Is there a weight inside the wood to give it more weight or is it just the feet that hold it in place? Sorry, I went back and saw your blurb about the steel core. Answered my question. Guess that would explain the price. The steel core is part of what makes the Gorilla baby so stable. The price is more a reflection of the labor involved with the production process, as each GB is hand crafted. Last time I was in town with the family, we tested out a few of the prototypes Steve and Haik put together. It was awesome seeing the evolution of the product (though I did not know the original was a rock!) and getting a chance to field test each iteration with different device cords. I'm happy to say I'll pick a couple up for our home. They'll go great with the walnut desks we have here, but would pair equally well with any modern or rustic design aesthetic. One day, we may finally have cordless everything, but until then, the GB is aces! Thanks so much for the kind words, Benjamin! Thanks for the support Ben! This is lovely...well thought out and great to look at, thank you for creating functional beauty--we all need more of that. When budget allows, I may join the ranks. ps, I also like the the rock. ?? Thank you Liz! The rock is where it all got started. The innovation behind Gorilla Baby is right from The Grommet’s backyard. Steve Listwon lives next door to our office, and he’s the Co-Founder of Jaywalk Studio, a design and fabrication shop around Boston. He and his partner, Haik Tokatlyan, heard about us and were inspired to make the first Gorilla Baby prototype from the remnants of their other design projects. Gorilla Baby looks like a minimal, natural piece of home décor, but it is actually a small—and stealth—cord organizer. Not many cord management solutions have a natural, artisan appeal. But this one is designed to organize and be beautiful at the same time. 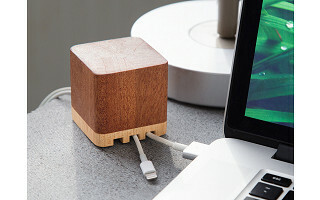 Handcrafted sapele and maple wood encase a steel core, which helps anchor the small cube to surfaces. Three low-profile grooves keep thin wires—like USB cables and phone chargers—straight, while silicone feet add traction. The natural wood grain and rounded corners look elegant and modern.